Our growing community is presenting incredible opportunity for legacy development. Our growing community is presenting incredible opportunity for legacy development. As we look to our future, the chance to build on our past achievements and cultivate regional prosperity is tremendous. From private/public infrastructure developments like the Market District expansion and redevelopment of our riverfront, to community-led projects like a new YMCA and Midtown Art Center and the robust University District development, our region is preparing to make its mark as a center for innovation and creativity. A vibrant urban core has far-reaching economic implications for our entire region. With the expansion of the Market District, the potential to increase engagement in downtown is enormous. The Market District plans include The Gordon Hotel, an 83-room boutique hotel, The Gordon Lofts, a 127-unit apartment building, 40,000 square feet of commercial space and 50 units of workforce housing in partnership with Homes for Good. Construction will begin this January with completion expected in 2020. The team at Obie Companies has a clear vision for increased housing in our downtown core, something that is in short supply, as well as a plan for amenities that draw professionals and visitors alike with shops, eateries, and activities that promote a vibrant urban neighborhood. “We understand the dynamics of what makes the 5th Street Public Market as a destination. Now is the right time to build upon that strength. We recognize the need for downtown housing and realized this was an opportunity for us to serve the greater community while building upon the mixed-use capabilities of the Market,” says Casey Barrett, Vice President of Obie Companies. The 5th Street Market and Inn at the 5th certainly attract visitors but the development also works to infuse opportunity for locals. “The vast majority of our shops and eateries are owned by local Eugeneans. When you support the tenants in the Market District, those dollars are staying in our community. As we continue to grow, we will continue to place a high priority on being as local as possible and supporting this community that means so much to me, and to our family and company,” says Barrett. Thanks to strong community, business support and dedicated elected officials, the Obie redevelopment project has already overcome initial barriers and is ready to move forward. With continued support like this, our hope is that ten years from now, residents of the Gordon Lofts will have have brought new life to downtown and supporting a variety of new businesses. The tax deferral for the apartments will have expired, and all three buildings will be generating nearly $1 million in taxes to support and strengthen local schools and government. Like the Obie expansion of the Market District, the redevelopment of our community’s beloved riverfront has incredible potential to transform our urban landscape. With a blend of public and private investments, the collaborative venture of developing the riverfront will create an active mixed-use urban neighborhood. “We were pleased to enter an exclusive negotiating agreement with the City of Eugene last summer, which gave us the chance to work with our design partner, SERA Architects of Portland, in close collaboration with City staff, to create a refined site plan consistent with the City’s long-term goals, particularly those articulated in its 2010 Master Plan. The Master Plan was developed with extensive public input and we want to ensure that the project respects and follows its principles,” says Jim Atkins, Principal, Williams/Dame & Atkins Development. Williams/Dame & Atkins Development has successfully navigated challenges similar to the constraints of this project, having completed projects in Portland's South Waterfront and Pearl Districts, as well as in South Los Angeles. Their focus on understanding the community and market realities adds to our confidence that the project will be met with both creativity and enthusiasm. 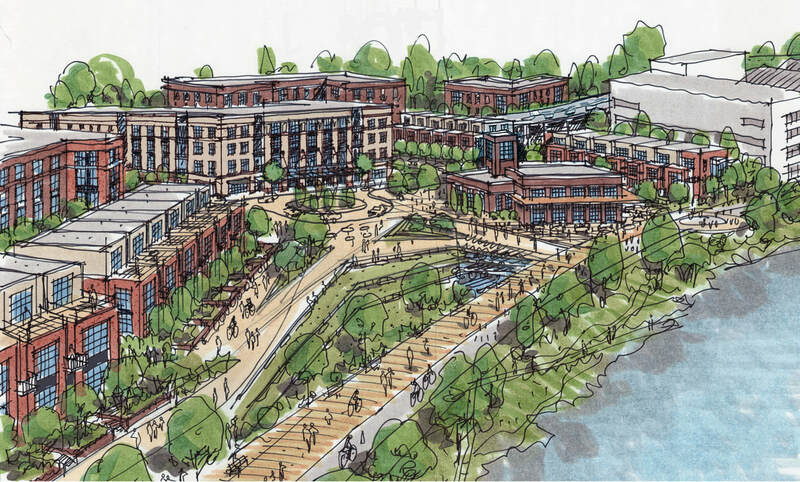 The plan envisions a neighborhood that is sustainable, inclusive, respectful of history, and seamlessly connected to Downtown Eugene, the Willamette River and the Market District. The development includes a new riverfront park with connections to the regional trail system that will improve pedestrian, bicycle and vehicle connections between Downtown Eugene and the Willamette River; a riverfront plaza with a 6000 – 8000 square-foot destination restaurant that would attract residents and visitors alike; and a variety of market rate and affordable homes. The iconic 1930s-era steam plant would be renovated to preserve the area’s historic character. Encompassing approximately 16.5 acres, the neighborhood would be developed in phases, with key elements completed in time for the World Track and Field Championships in August 2021. The long-term vision also includes a pedestrian bridge connecting the neighborhood to Alton Baker Park. The infrastructure investment and approximately $100 million in private capital investment in the district will create short and long-term jobs and generate new tax revenues that will benefit everyone in Eugene. Eugene Ballet, in partnership with local philanthropist Alex Haugland, are building the New Midtown Arts Center. This facility will support the administrative offices and rehearsal facilities for Eugene Ballet and eight of Eugene’s leading non-profit arts organizations including Chamber Music Amici, Eugene Concert Choir, Eugene Opera, Instaballet, Lane Arts Council, Orchestra Next, Oregon Mozart Players, and Pacific International Choral Festivals. The project, which broke ground in the spring of 2018, is a mixed-use development, made possible through a unique non-profit/commercial partnership. The end result will be increased market rate housing in the Midtown area of Eugene that will support the stability of the non-profit arts and culture sector. This mix also works to enhance the neighborhood by infusing our community with arts and business partnerships and strengthen our reputation as an arts-rich community. Scheduled for completion in 2020, this 30,000 square foot center will serve as the heart of the larger project which will include 40 market rate condominiums. The new Midtown Arts Center will provide space to create over 20 new non-profit arts jobs. In addition, nearly 200 employees and contractors will be utilized during the construction of the facility. Once completed, the Midtown Arts Center will draw 500+ students and their families to classes, and the 70+ residents will increase activity at nearby businesses. The increase in activity will serve as a catalyst for new development and further investment in the growing Midtown section of Eugene. ​The University of Oregon's Phil and Penny Knight Campus for Accelerating Scientific Impact is an ambitious $1 billion initiative to fast-track scientific discoveries into innovations. The project aims to reshape higher education by fostering stronger ties across disciplines and within industry to expedite scientific innovation. This approach will create new educational opportunities, spin-off technologies and companies, and improve quality of life across the globe. The Knight Campus is attracting national attention for its innovative approach to engaging and growing new generations of scientists. “I was recently talking with a group of students and alumni. Afterwards, two high school students approached me asking for more information about the Knight Campus and whether they will be able to study there in the coming years. Connecting the Knight Campus to undergraduate and graduate education is one of the University of Oregon's top priorities. 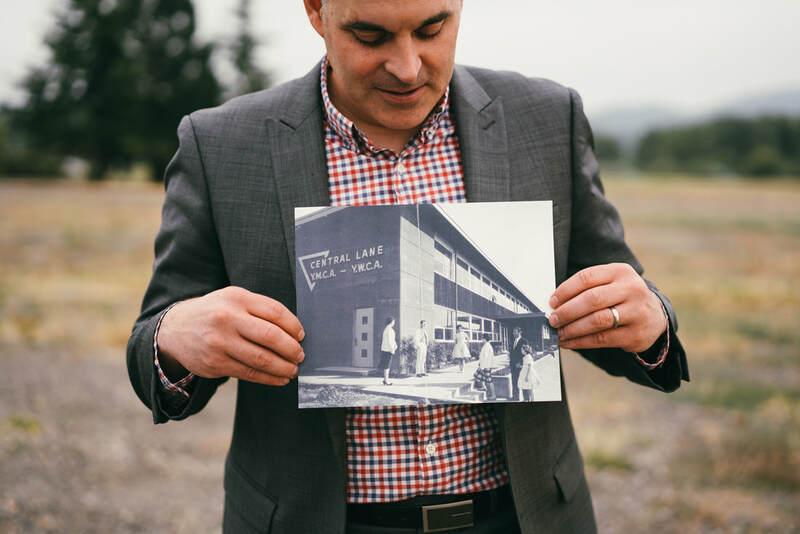 The Knight Campus is a game-changer for the University, for Eugene and even for the state, and its impact will continue to grow and expand in the coming years,” says Kyle Henley, Vice President of University Communications. During peak construction, the Knight Campus will directly contribute about $100 million in annual economic activity, which will support more than 1,300 jobs. When fully operational, the Knight Campus will drive nearly $80 million in annual economic activity and support more than 750 jobs. “The Knight Campus will serve as a launch point for incubating new Oregon-based companies and as a training ground for a new generation of scientific entrepreneurs.” says Henley. For Eugene, the implications reach father than regional economics. Being the home of the Knight Campus will further position our region as a creative powerhouse, drive scientific discovering and establish Eugene as a hub for innovation across industry sectors and educational disciplines. This is the type of legacy we need to kick-start strong, sustainable growth and quality of life in our region. 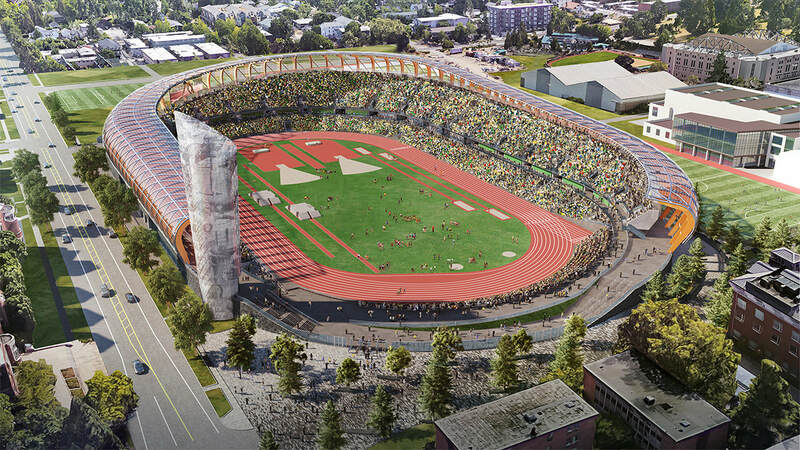 ​When the eyes of the world are on Eugene during the 2021 trials, they’ll be focused on a new state-of-the-art track and field stadium. The renovation of Hayward field will set a new standard by creating a world-class sports venue, training and competition facility. “When complete, Hayward Field will be nothing less than the finest track and field facility in the world, emblematic of the risk takers and innovators who have made Oregon great,” said Michael H. Schill, University of Oregon president and professor of law. "The new design for Hayward Field is awe-inspiring, amazing, and completely in accord with the university's relentless pursuit of excellence in everything that we do." The intent is to honor the strong heritage of Hayward Field, including the legacies left by Bill Hayward and Bill Bowerman. The new stadium boasts an increase in capacity with 12,500 seats and an additional expansion of up to 30,000. Fully funded by private donors, with a lead gift by Phil and Penny Knight, the new field broke ground this summer and will be complete by 2020. This new construction helps to strengthen our reputation as Track Town, USA and prepares Eugene to host bigger events in the future. It's a shining example of leveraging possibility to drive improvements that will boost our economy long-term. The Y has been supporting our community since 1887. During that time, it has been a trusted resource for healthy living, youth development and community-building. It’s also the largest provider of after school childcare in Lane County. The existing facility is more than 60-years-old and averages more than 21,000 visits a month. Having outgrown its space, the Y is embarking on a legacy project to build a 65,000 square foot facility at the corner of 24th and Hilyard, which will double the capacity to provide services and subsidize critical health and education programs. The new Y will include a flexible floor plan with an array of wellness and exercise rooms, an indoor aquatic center, pre-school classrooms, and a multi-generational activity center, along with ample parking. The new building will help the Y fulfill their mission of providing health and wellness, and youth programs to all. “At the Y, we believe in relentless innovation. Your Y will continue to innovate to ensure we are influencing today’s youth and individuals to help create tomorrow’s best Eugene. Over the next decade, we know that health challenges, demographic trends, disease and chronic conditions will only present challenges within our community. Your Y will continue to innovate to ensure we are influencing today's youth and individuals to help create tomorrow's best Eugene,” says Brian Steffen, CEO of the Eugene YMCA. Short-term economic gains include employing local workers on a significant construction project, while concurrently employing 300+ individuals in Y work. Long-term advantages to the overall health of the community will improve workforce contributions to our economy. This project will also provide significant opportunity for business collaboration and recognition through naming rights and sponsorship, and is grounded in a revenue generating model that will in turn, benefit outlying neighborhoods. “Eugene is on the edge of substantial opportunity. Its how we come together to thoughtfully manage growth and cultivate culture that will establish a legacy for years to come."